'Dinner Time' by Kathy Ruck. Chester County artist Kathy Ruck will have a solo show of her watercolor paintings at Hardcastle Gallery (5714 Kennett Pike, Centreville, Del.) in October. The exhibit features landscapes of Chester County and Northern Delaware, as well as some florals. The Opening Night Reception is Oct. 2 from 5:30 to 8:30 p.m. Refreshments will be served. For more information call 302-655-5230 or visit hardcastlegallery.com. 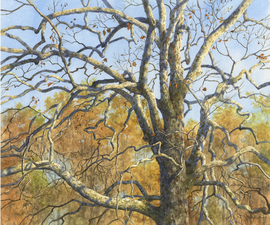 'Autumn Sycamore' by Kathy Ruck.